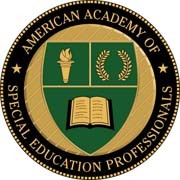 In partnership with The American Academy of Special Education Professionals(AASEP), NASET members now have the opportunity to achieve AASEP Board Certification in Special Education - (B.C.S.E.) at a reduced fee. AASEP Board Certification in Special Education - (B.C.S.E.) is a voluntary choice on the part of the candidate. The candidate for Board Certification wishes to demonstrate a commitment to excellence to employers, peers, administrators, other professionals, and parents. From the standpoint of the Academy, board certification will demonstrate the highest professional competency in the area of special education. Board Certification in Special Education establishes a much needed standard for professionals, across disciplines, who work with exceptional children.